If a contractor will solely provide all the deliverable for a project, then contractor agreement examples can be created. However, there are instances where the help and expertise of subcontractors are needed. A subcontractor is the entity who does the work or parts of the work that a contractor was hired by a business or a person to do. 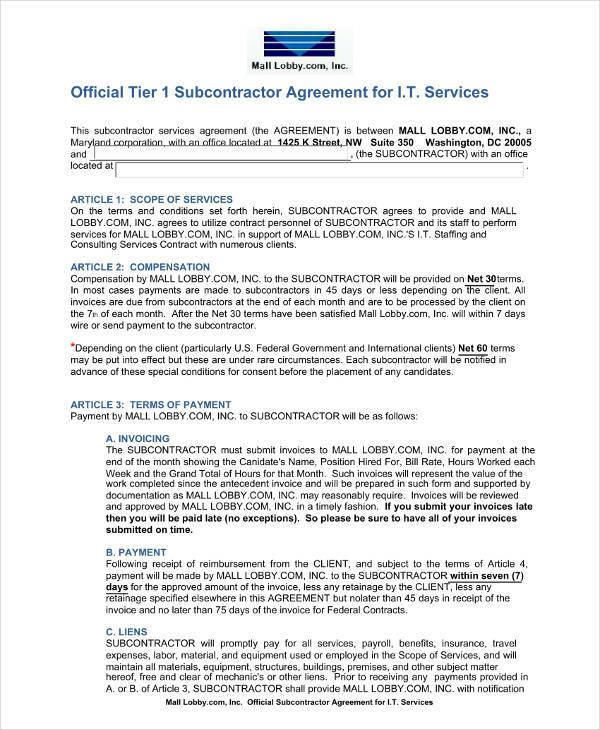 In transactions like this, it is very important for a subcontractor agreement to be created. 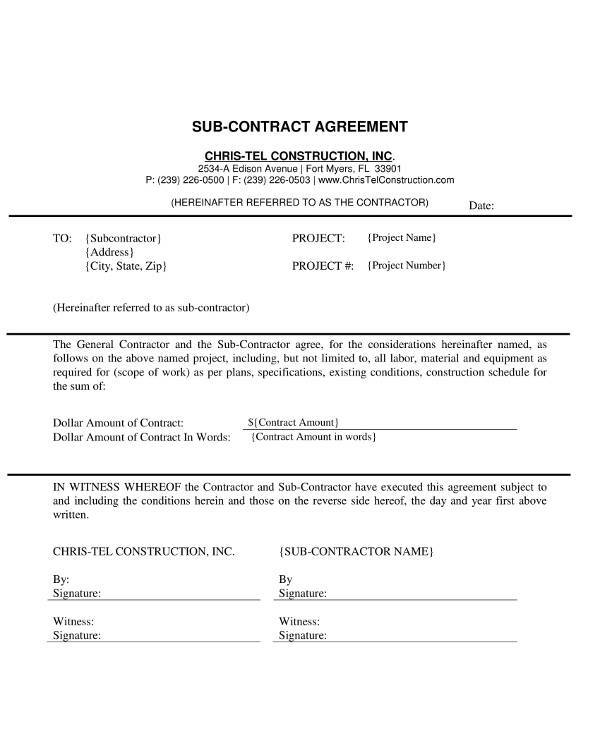 A subcontractor agreement is the document that specifies what a general contractor and a subcontractor has agreed upon with regards the scope of their responsibilities for a particular project. 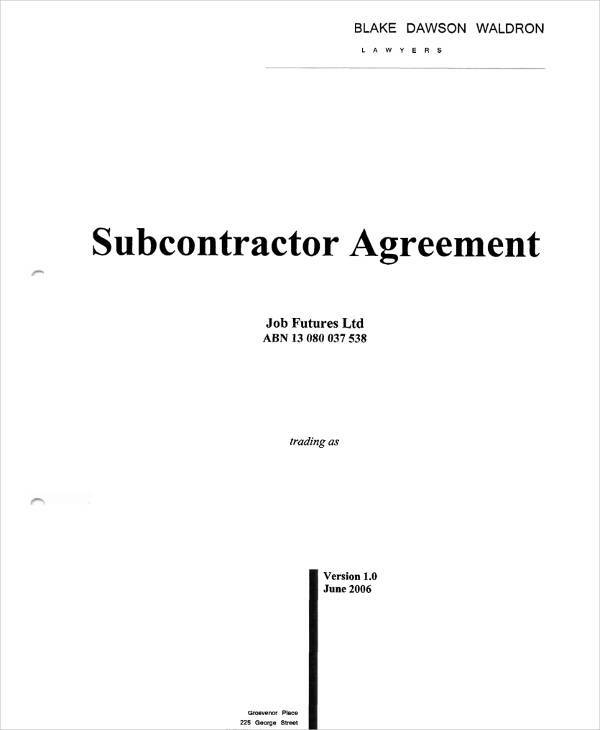 If you want to make a subcontractor agreement, feel free to use any of our downloadable examples as references. 1. Provide the subcontractor with the information about the timeline of the project. Your subcontractor agreement must give focus on the time where the project works are expected or estimated to be finished and completed. Aside from the expertise of the subcontractor, you should also ensure that they can deliver expectations in a timely manner. You may also business agreement. 2. The discussion about the provision and buying of materials must be present in the subcontractor agreement. This will depend on the demands of the client, or the decision of the contractor. There are some instances where the subcontractor will provide the materials depending on the requirements of the contractor. There are also possibilities for the contractor to give the materials to the subcontractor to ensure that the actual specifications of the clients will be achieved. You may also see roommate agreements. 3. Ensure that there is a clear negotiation between the contractor and the subcontractor. There should be a determined and concise list of the work processes that will be assigned to the subcontractor. In this manner, the specific call to actions and responsibilities that will be given to the subcontractor can be clearly defined. This can result to a successful relationship between the contractor and the subcontractor. 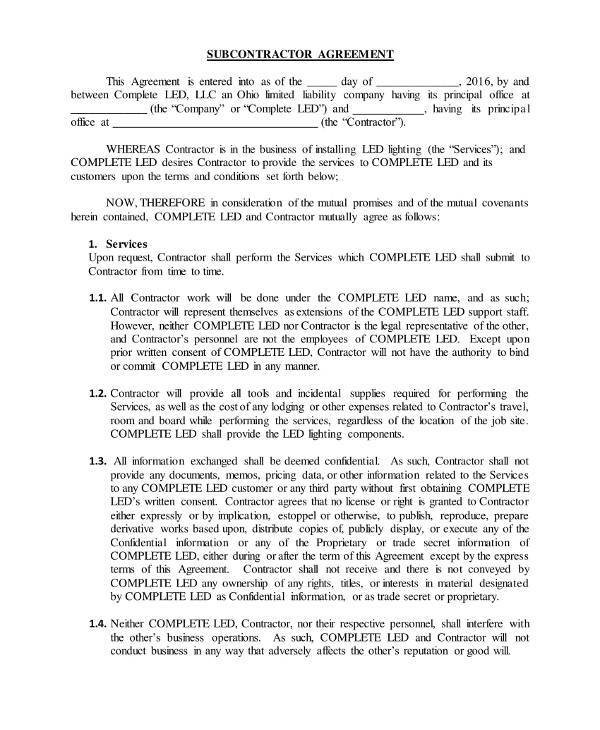 You may also see commercial lease agreement. 4. Discuss the amount that will be given to the subcontractor in exchange of their services. 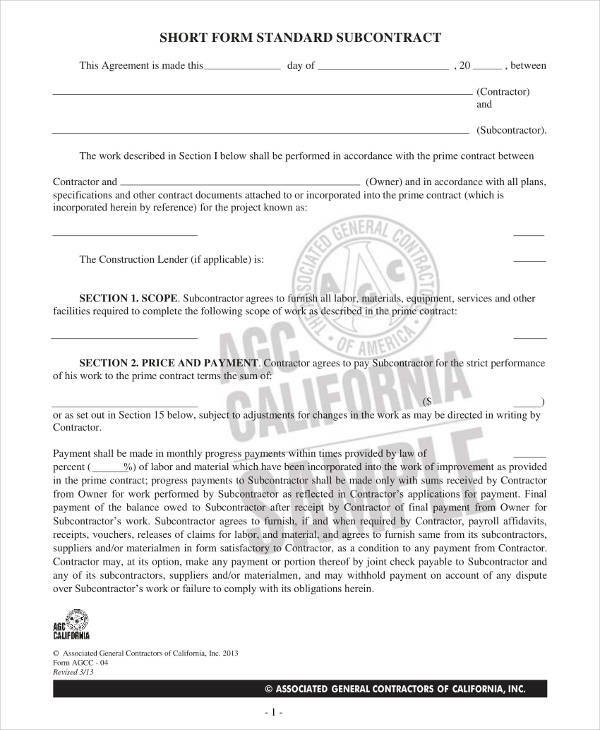 Payment terms, time frames, and conditions must be laid out properly so that the subcontractor can be aware of the dates where determined payment amounts can be expected. 5. Like any business agreements and simple agreement letter examples, ensure that there will be a clause stating the possible termination of the agreement due to certain circumstances like breach of contract. This can help protect the rights of both the contractor and the subcontractor. 1. 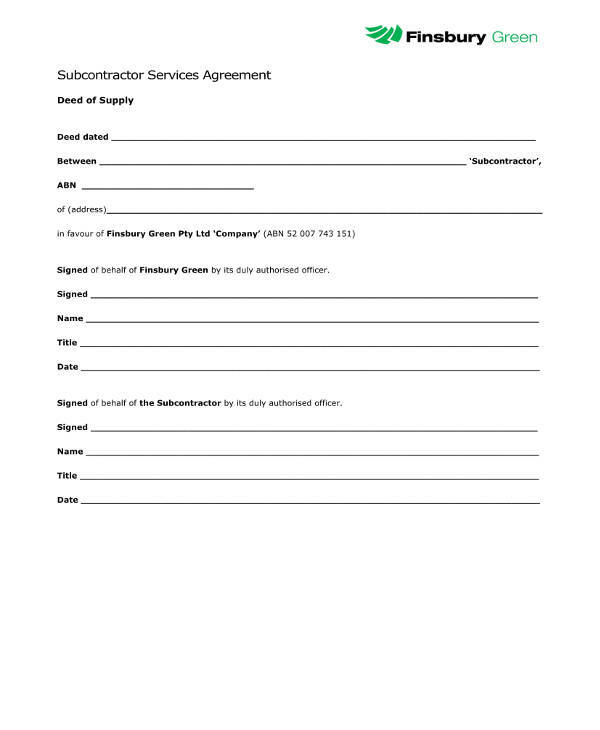 Write the date when the subcontractor agreement has been made. 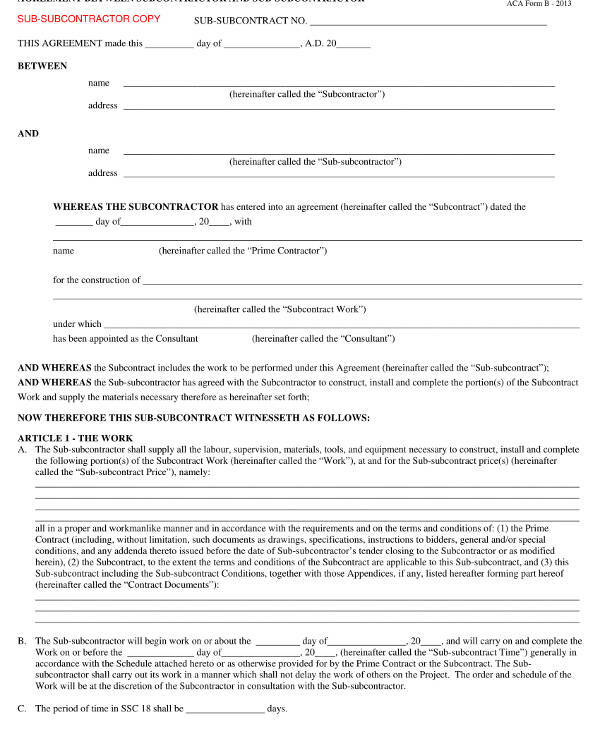 Also, include a subcontractor agreement title that can help the document become more recognizable. 2. The initial draft of the agreement must start with the identification of the parties who will do business with one another. 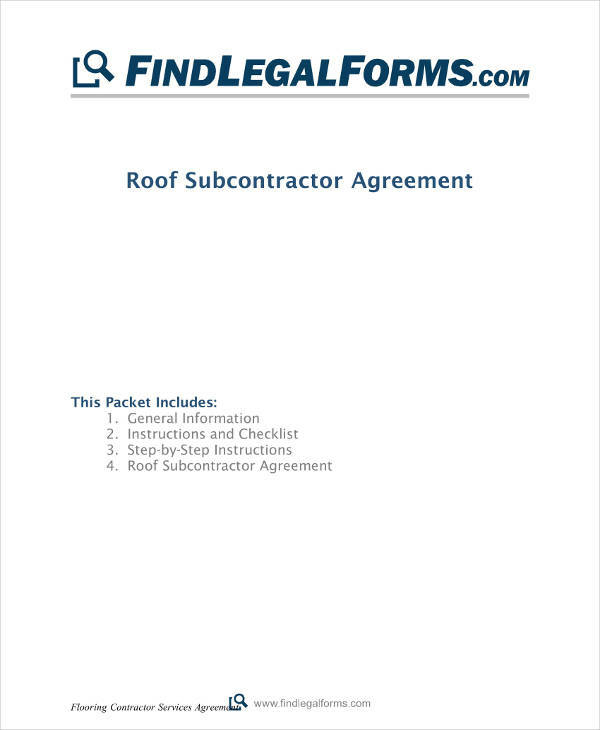 A subcontractor agreement must have the business names of the contractor and subcontractor as well as the identification of the representatives of both parties who will sign the document. You may also see Acceptance Letter Examples. 3. One of the essential information that should be in a subcontractor agreement is the definition of the project’s scope and limitations. There should be a list of the minimum requirements that the subcontractor must meet. 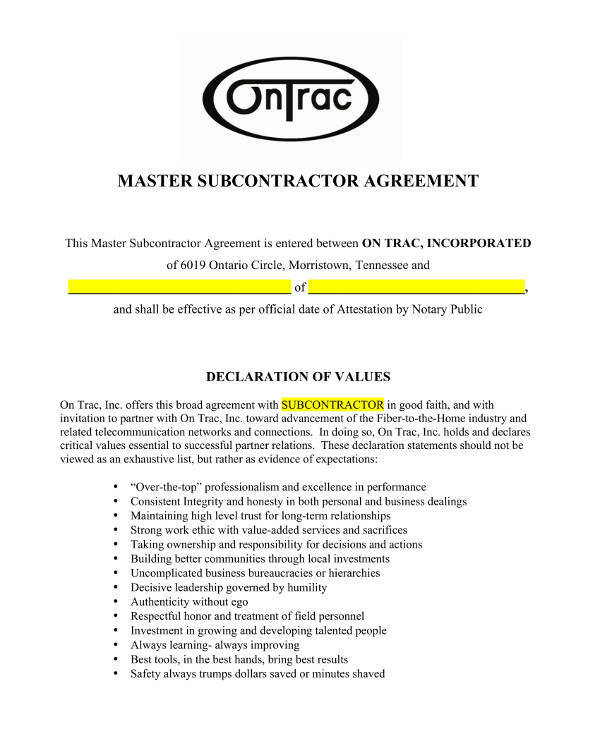 Hence, description of subcontractor work must be well-defined within the agreement. 4. Aside from the work scope within the project, there should also be a discussion about the obligations of each party to one another. There should also be a specification of the rights of both the contractor and the subcontractor during the project. You may also see simple agreement letters. 5. 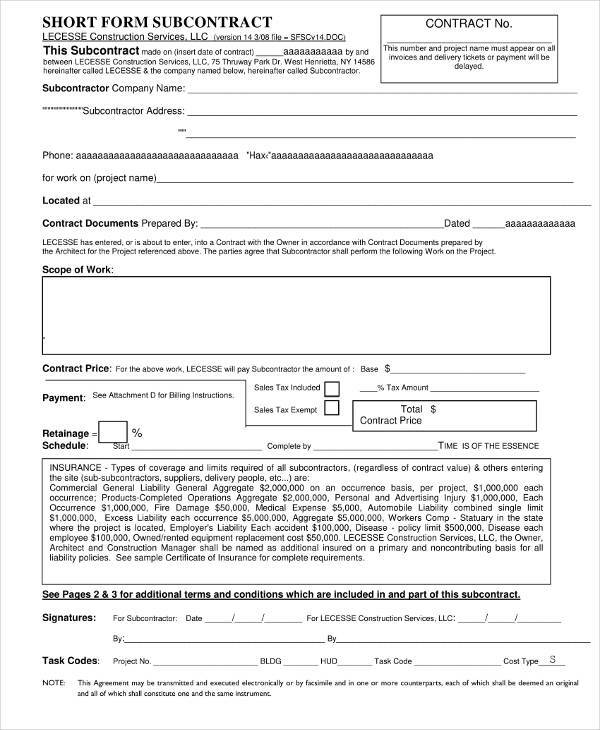 The payment rate of the subcontractor must be specific. Payment schedules within the project duration and the date of the final pay must also be included in the document. You may also see contract examples. 6. If necessary, include indemnification, non-disclosure, confidentiality and privacy, as well as warranty clauses in the subcontract agreement. This will depend on the kind of project that you are currently working with. 7. It is important for a signature block to be at the end of the subcontract agreement. Make sure that all parties will sign the document once they have already agreed with all the agreement content and there are no revisions or changes that are needed to be done anymore. You may also see sales agreements. Agreement examples in Word, PDF, or Excel must be carefully done as these documents will serve as the foundation of projects, programs, business transactions, and other professional activities. In circumstances where the services of a subcontractor is highly beneficial to a project or any undertaking, a subcontractor agreement must be made. Listed below are the instances that proves how important a subcontractor agreement is. 1. 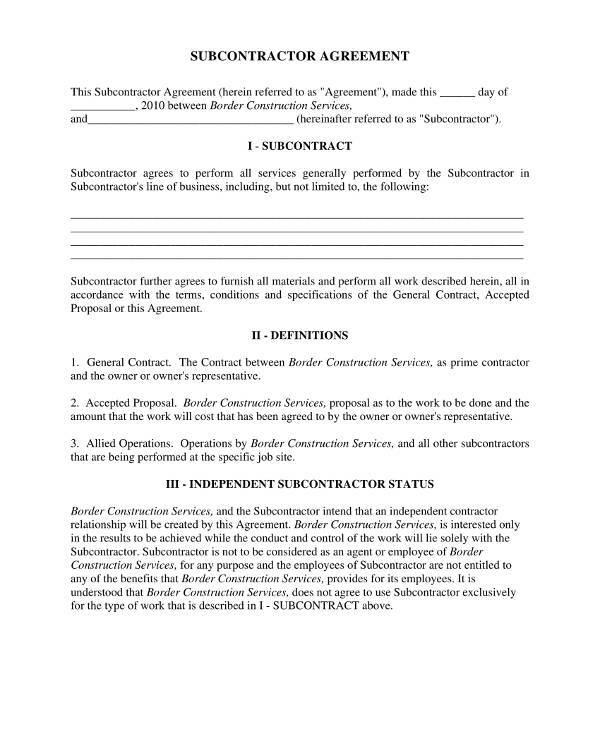 A subcontractor agreement can give an idea about the kind of work processes that should be executed by the subcontractor. With this, the subcontractor can assess its skills, capabilities, and resources properly based on the demands of the project where they will be hired by the general contractor. You may also see hold harmless agreement examples. 2. A subcontractor agreement can give an assurance to the contractors that the subcontractors are aware of what is expected from them. Hence, over promising and nonperformance of work tasks can be removed from the transaction. With a subcontractor agreement, it will be easier for contractors to enforce the initial demands of the project. You may also see management agreements. 3. A subcontractor agreement can clarify all the concerns and issues of the subcontractor. 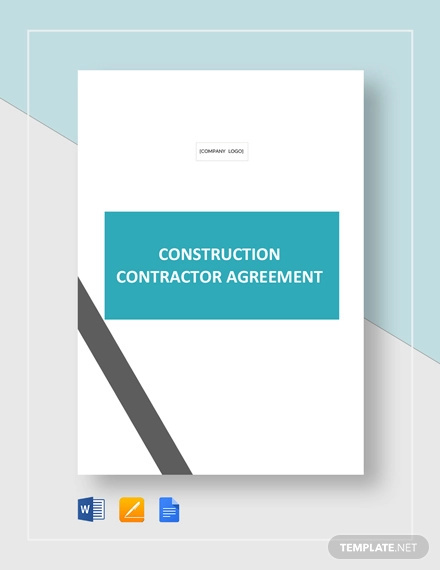 Since the specifications of the projects are thoroughly explained in this document, subcontractors can be knowledgeable of the minimum requirements that they should give to the table as well as the value that they will receive in exchange of their services. 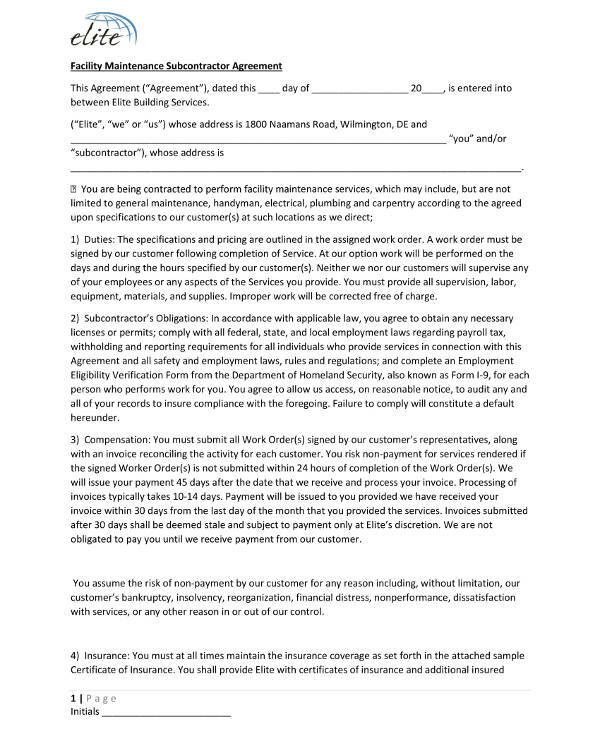 You may also see business agreement letter examples. 1. 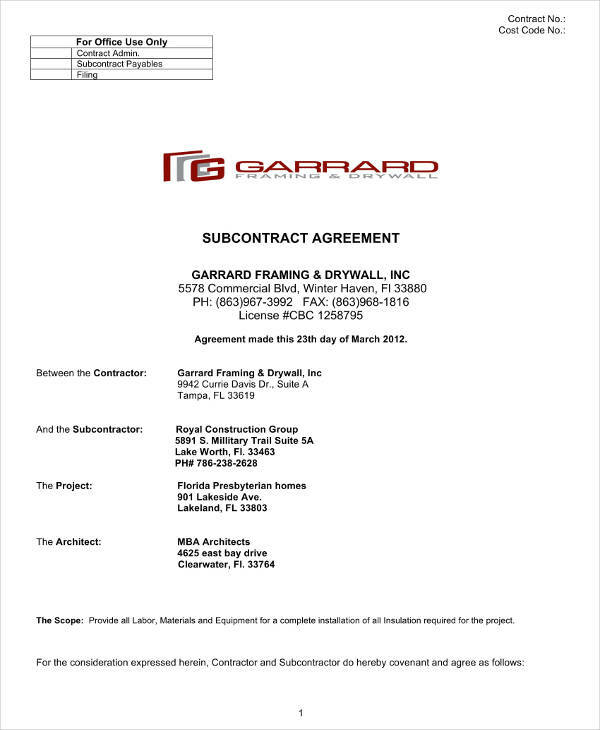 Be guided by a to-do checklist when planning to create a subcontractor agreement. This tool must include your meeting with the subcontractor, the development of the subcontractor agreement, the potential revision dates of the subcontractor agreement, and the demands of the client which should be achieved by the subcontractor. 2. 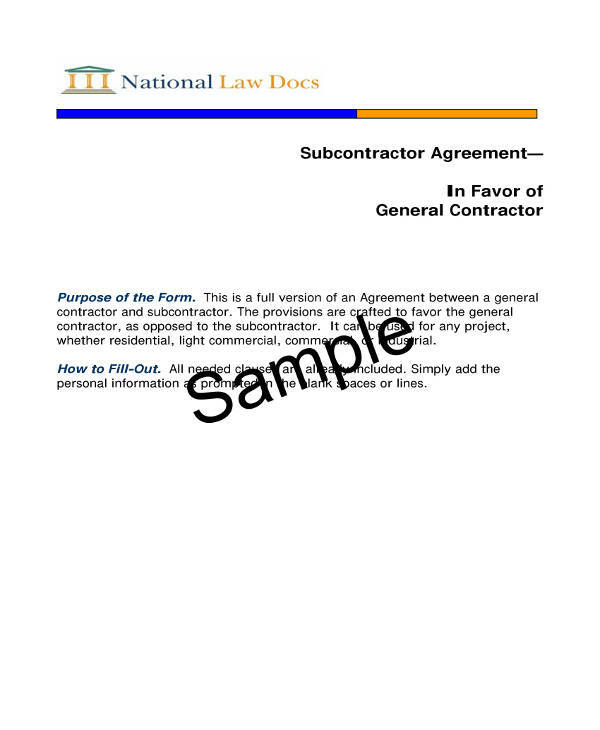 Use examples when creating a subcontractor agreement. References like downloadable examples can make it more efficient for you to come up with a comprehensive subcontractor agreement. 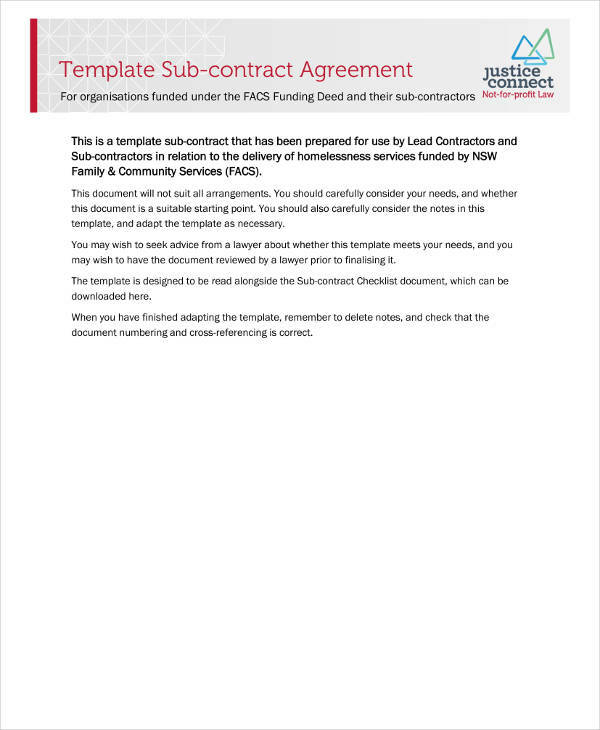 This will also work best if you do not have any idea on how to write a subcontractor agreement or if it is your first time to make one. You may also see partnership agreements. Using our listed tips and examples, be guided with the creation of the subcontractor agreement that you need. 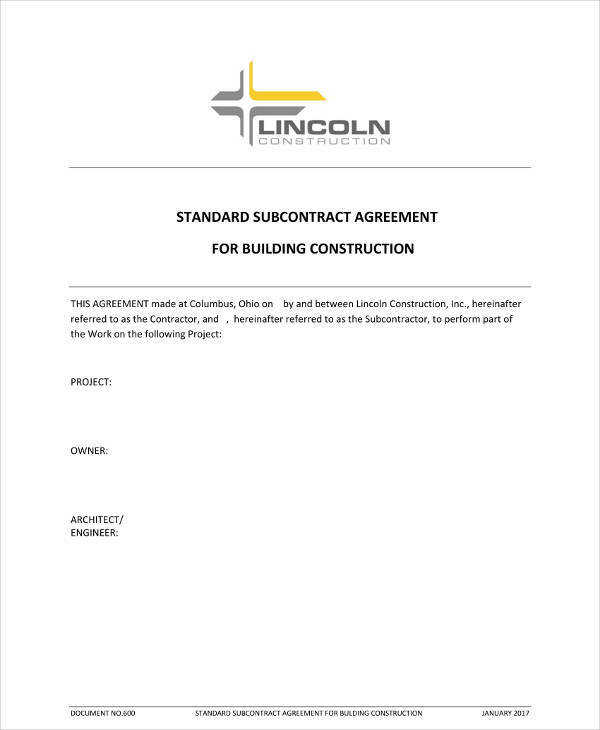 Make sure to select subcontractor agreement references that are used in the same purpose or objective where your own subcontractor agreement will be most beneficial. You may also see non-compete agreements.